On December 1 Romania held a military parade to celebrate the 100th anniversary of The Great Union, the foundation of modern-day Romania. On this day in 1918 the National Assembly was held in Alba Julia (Gyulafehérvár in Hungarian), where 1,228 elected delegates adopted the union resolution. The declaration promised “full national freedom” to all minorities and was read at a public event attended by over 100,000 people. A hundred years later hundreds of military vehicles, aircrafts and foreign servicemen from NATO countries celebrated National Day at the Arch of Triumph Square in Bucharest. Troops from Albania, Bulgaria, Czechia, France, Germany, Greece, Italy and many other countries were there. U.S. Secretary of State Mike Pompeo thanked Romania for its contribution to NATO and Canadian and US soldiers marched in the parade. 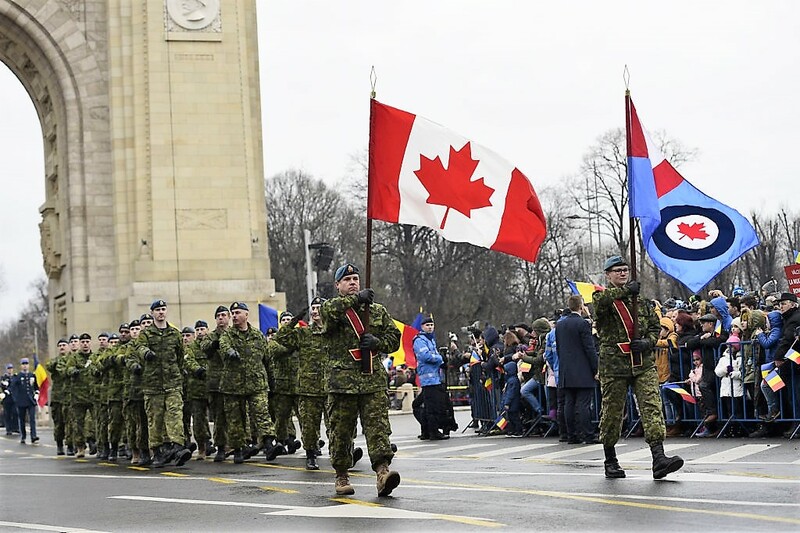 Canadian soldiers celebrate Romania’s National Day on December 1, 2018. 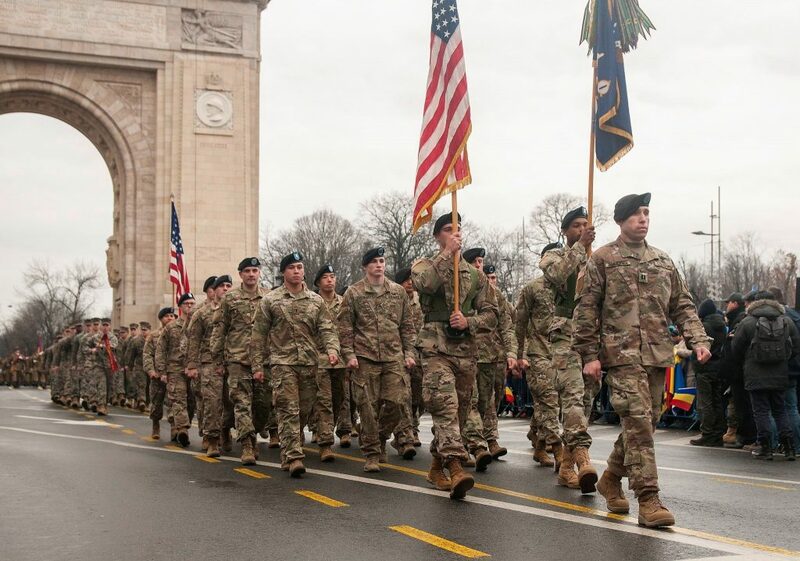 US soldiers march on Romania’s National Day on December 1, 2018 in Bucharest. Authoritarian Hungarian Prime Minister Viktor Orbán declared that Hungarian officials would not attend the Romanian National Day events. “I am a traditionalist and I think that sincerity is the best method, even if sore points are at stake. Here we have a diplomatic sore point, but it’s better to sincerely assume the conflict than being double-faced. Magyars have no reason to celebrate on December 1st, so they don’t celebrate, which is an honest attitude to the Romanians as well, for at least we don’t lie to them. I believe that the Magyar diplomacy was right when choosing this honest, sincere way” Orbán said. Romania has a significant Hungarian minority and there are still unresolved issues. Many feel that the unification proclamation of 1918 promised autonomy to the Hungarian minority which has never materialized. Yet, insulting Romania by boycotting the country’s National Day won’t help to resolve the issues. Only goodwill, flexibility and negotiations with great diplomatic skill and wisdom can provide solutions. By picking fights and insulting Bucharest (and NATO allies) Orbán is alienating his country again and acts against the interest of the Hungarian minority in Romania. I have a feeling that the majority of Canadians and Americans of Hungarian origin denounce Viktor Orbán’s rude boycott and congratulate to Romania on its National Day. Your opinion is just rooted in your ideological convictions Mr. Lázár! Only those who don’t reject the criminal treaty of Trianon will congratulate Romania on its National Day. Orbán has always been ignorant and clumsy in international politics, nothing new here. Could have sent a low level official to say a couple of words about hoping that constructive relations …. blah blah and tick the box at this sensitive event, but he’s been again pigheaded for his domestic bums. Bad politics to throw loud insults and have no stick (to paraphrase Teddy Roosevelt), as GL noted, this unbecoming gesture won’t do any good, but Orban has completely different goals than the good of the nation. I see! So if for instance, the Vienna decision of returning part of Transylvania to Hungary would have been upheld, and Hungary would currently celebrate that historical event as its national holiday, do you think Romania would have accepted an invitation to participate in Hungary’s parade? Do you realize how absurd it is to demand for people to celebrate something that they view as reason for sorrow? What are I talking about? Who’s asking Hus to celebrate? It’s a diplomatic game and pigheaded Orban doesn’t know how to play it, he’s a spoiler and wrecker anyway. Well, this article which states that Hungary should have participated in the parade, thus celebrating with Romania, and also you! Unification proclamation of 1918 promised autonomy to the Hungarian minority? What about start to get our of the mystique of broken promises (it wasn’t any) and recollect that historical moment with a story told by a Hungarian? Does Gyorgy Lazar feel that Native Americans should celebrate Columbus day? Other countries participated because it is Romania’s national holiday, which to them means just that. For Hungarians that day means a grave historical injustice, leading to permanent, ongoing damage to the Hungarian nation. For the ethnic Hungarians living there it was the beginning of the end to their cultural presence. In 1918 Hungarians made up a third of the population in the region, now they are about 18%, mostly concentrated in two enclaves, with most of the rest of Transylvania thoroughly homogenized. Ethnic Germans got it worse than that, given that they numbered 700,000 in 1918, now there are 36,000 calling themselves ethnic Germans, but in reality many families with even one distant ethnic German ancestor call themselves that, because it has become hip, given that Romanians now see them as the “good minority”, in other words the one that was ‘gracious” enough to disappear, unlike the “nasty” Hungarians who are still there and still demand their basic rights, meant for preservation of their culture. If Romanians get their way, Hungarians will go the way of the ethnic German minority by 2118, so really Hungary participating in that parade would have been a slap in the face for the ethnic Hungarian minority living there, and for the entire Hungarian nation, since it would validate a historical injustice, as well as the on-going homogenization of the land that the lottery of History has gifted to the Romanians (France’s perceived strategic interests at the time). Of course, Gyorgy Lazar not long ago embraced the slogan of extremist Romanian hate group Noua Dreapta “A Szekelyek nem Magyarok”, so I doubt any of this bothers him much! I think he would be much more comfortable hanging out with Romania’s Noua Dreapta, or Ukraine’s Pravyi Sector than he he does whenever he visits Hungary, returning with his usual feelings of disgust for everything about his native country and nation. Maybe next time he visits Europe, he should skip Hungary, fly to Bucharest and look up one of Romania’s recent prime ministers, who vowed to hang ethnic Hungarians. They could talk about that for a while, giving him much satisfaction, leading to a much more pleasant and satisfying holiday for him. Man… get over it! It`s a naturally occuring process! Both in Hungary and in Romania! 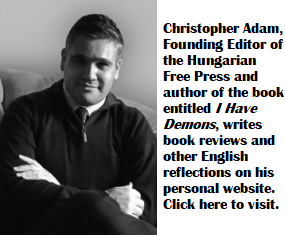 Nobody in Romania is persecuting the Hungarian minority, because of what they are! They are just slowly and naturally are being assimilated BACK, in to the Romanian(Dacian) culture, that which they originally were centuries before! And to also provide you, with a clear and historically documented example from Hungary… in 1944 Danish- born, German soldier during W.W.II Sven Hassel(Sven Hazel), clearly records the fact that Debrecen(Debretzin in Dacian) in modern day Hungary, back in 1944, 33% of the town populace was ethnic Romanian! Where are all the ethnic Romanians from Debrecen, nowadays Joe? Where have they dissapeared? Many of those 700k Germans you talk about, did not get assimilated by the Romanian populace! Hitler took most of them back to Germany in 1940! The germans made themselves dissapear by joining Hitler`s army and going back to Germany to work in Hitler`s war factories! They chose their fate willingly and unconstrained by absolutely anyone! Historical injustice??! You must be joking! You do of course realize, that the original deal with the French and the other Entente powers, was for all the land until the Tisa to be Romanian territory… or to be more precise, the modern day border between Romania and Hungary, was normally meant to be right smack in the middle of the Tisa river, in present day Hungary! But because of the Russian October Red(Communist) Revolution in 1917, Russia failed to supply Romania with the initially agreed upon troops & ammunition anymore, which forced Romania to sign a temporary armistice in Bucharest, between May 1918 and 10th November 1918. This sole act, was reason enough for the French to “turn their butts” regarding the original agreement, although Romanian troops had fought extremely hard, in some cases even commiting conscious kamikaze-attacks and losing a total of 81,28% of it`s army… 535,700(335,706 dead, 120,000 wounded & 80,000 captured) casualties, out of a total initial force of 659,088 combatants! Therefor I ask you Joe… who was most “injusticed” at Trianon?? Hungary or Romania? Don`t forget! 33% of Debrecen were Dacians(Romaians) in 1944, as Sven Hazel himself noted in one of his novels! The logic of irredentism puts Hungary at odds with its neighbors to varying degrees. The narrative of a wounded and oppressed nation is at the very core of Hungarian foreign policy and the cover for insisting on national unity – under FIDESZ guidance, of course – at the cost of liberal democracy. As long as no one takes it too seriously, the neighbors can treat this as a bad case of neurosis, but it’s not difficult to imagine situations where irredentism could trigger a more robust response. The inevitable climb down will be painful and humiliating to Hungarians everywhere. Following your logic, the fact that native Americans do not observe Columbus day and regard Thanksgiving as a day of mourning, must necessarily mean that they do not accept the demographic changes of the past 500 years, and they feel that everyone should go back to their own ancestral continents, so they can have their lands back (native irredentism). This is not about territorial pretensions (irredentism). It is simply a matter of choosing not to participate in a celebration of an event that for Hungarians is a justified source of sorrow. In Gyulafehervar (Alba Iulia), Where the proclamation that Romanians celebrate was made, in 1918 about half the population was ethnic Hungarian. Now they are 2% of the population. Would you celebrate that? Do you think it is reasonable to expect for anyone to celebrate that? The French and the Germans celebrate Armistice day together, although Germany lost Alsace and Lorraine. Being good neighbors is more important than nurturing every disaster. In about 100 years both of those countries will be hosts to a non-European demographic majority, with the apparent consent of the current majority native population, which seems either unaware or uncaring of the fact that they will become a minority on their own land, and what that may mean for their grandchildren (assuming they ever expect to have any). So indeed, what use arguing over such matters? Besides, after Hitler, Germans entered a period of national, ethno-cultural collective shame, which made for such acceptance of national humiliation possible. Undergoing such humiliation every year, may seem like a good way of dealing with their eternal historical shame. And I do believe that Romania & Hungary can also be good neighbors. What would be needed most, would be more tolerance on the Romanian side of the ethnic Hungarian minority, perhaps adopting policies along the lines of Italy’s treatment of ethnic Germans. Also, Romanians demanding and expecting Hungarians to celebrate a day of sorrow, does not help. Can’t Romanians celebrate their own good historical fortune without that? And like I said, it is not just about a past disaster, but the on-going disaster, that is the ethnic homogenization of Transylvania. Wasn’t it Orban who wanted ethnically homogenous Hungary? Or was it Romania? The real ongoing disaster is the orban regime wrecking the nation/country and robbing its resources big time. The Hun minority in Ro is already living not worse than those in Hu (eg. the emigration of ethnic Huns to Hu has practically stopped). Yes, soon after the FX debt disasters at government and consumer levels. Socialists oversaw that. Hungary is opposed to mass-migration from ME-Africa, not to historical minorities living in Hungary. In 1920, there were 23,000 ethnic Romanians in Hungary, now there are 26,000. In Romania there were 1.7 million ethnic Hungarians in 1920, now there are 1 million. And in Hungary, in Romanian-majority Mehkerek, the Romanian flag was adopted as local flag and flies in front of municipal building. In Romania, dozens of Hungarian majority towns were fined for adopting local flags, even though Romanian-majority towns do so unhindered. So please, be honest and do not try to draw non-existent parallels. The only thing left for you to throw at this is the kitchen sink, because distortions and lies you already tried! Joe… in 1920 in Hungary you should try nearly 1 million ethnic Romanians(Dacians)… not just 23k…! Never forget that lots of people demands in Moscow the return of Alaska, the DDR, and all the so called peoples republics. And they have a better chance to carry that out. Hungary could never get along with her neighbors for their common interest and defense. The hate and antagonism that ruled always. Never seem to want to get away from that either. What Romania pledged back than was individual freedoms, not group separation by ethnic origin . O have the sinking feeling Bucharest does it better today than Hungary. But never forget what actually followed the declaration. The Romanian Army marched and occupied niot just Transylvania but most of Hungary. In top of that declared a united monarchi, with the king of Romania as the head of state. Today you might thank Horthy that the Romanian army left Hungary. Otherwise I ‘d be forced to write this in Romanian. Viktor Orbán is a silly peasant who understands truth as much as diplomacy.